That's a wrap! GDPR-day is behind us and we are done updating this blog post. We do have some additional legal matters but they will be announced privately in WebHotelier's Backoffice. Thank you very much for your time and patience following these updates. 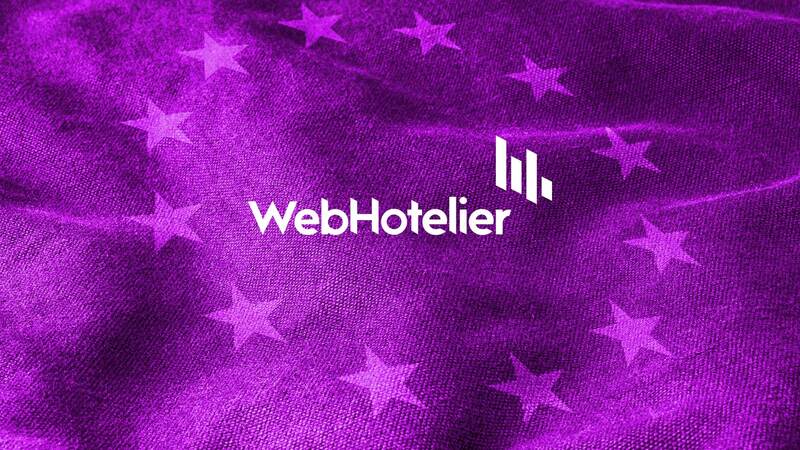 In WebHotelier we don't believe in compliance for compliance’s sake. What at first seemed as a cost of doing business, we now see as an opportunity to implement operational excellence. When the right internal controls are implemented, compliance is no longer a costly burden. What a business does to comply adds tremendous value, offsetting the cost of compliance. It has been true for us since the day we received our first signed PCI certificate. Today, we are proud to launch a new WebHotelier initiative called Compliance Dashboard. It is a tool that will hopefully help you achieve your own compliance goals. 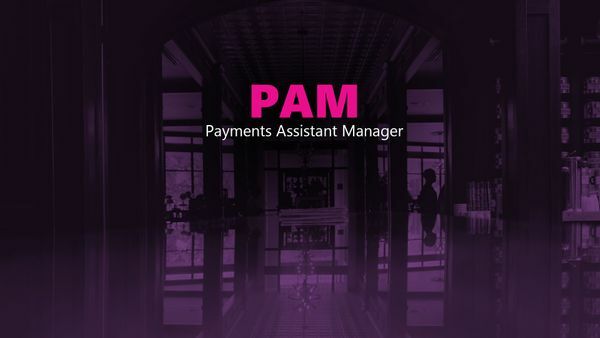 Accessible from WebHotelier's Backoffice, it reflects our experience in security & compliance for both PCI-DSS and GDPR. This first version just covers the basics. 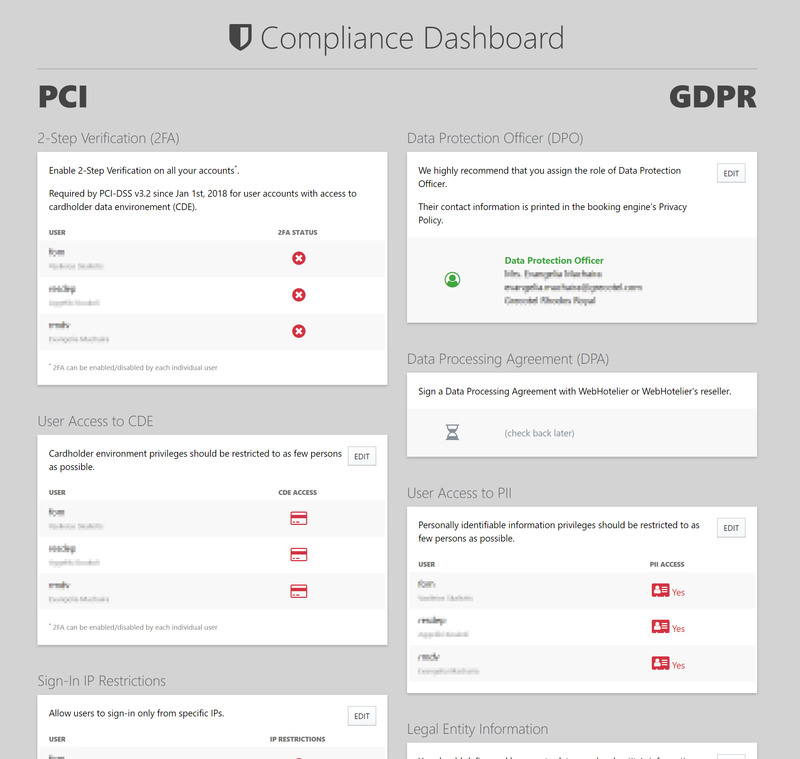 It provides a birds-eye view of all security & privacy settings and consolidates the many new GDPR features we launched all in one screen. We have plans to enrich the dashboard with more reports, audits and logs, tips and best practices, and more, so check back often. Data security and privacy have become critical trust and reputation issues for all businesses. We want to provide you tools that enhance trust and advance your brand, reputation, and competitiveness. Since we launched WebHotelier, almost ten years ago, we've been sending a copy of confirmation emails to hoteliers. Confirmation emails serve as both a notification and a quick preview of the booking summary. Unfortunately, they also contain personally identifiable information (PII). E-mail servers & clients are not a secure place for such data (in the same way they're not for cardholder information). Therefore, effective immediately, we anonymize all PII in confirmation emails sent to hoteliers. Confirmations emails sent to guests are not affected by this change. We know this hurts, but it is the new reality post-GDPR. Hopefully, this will also break the bad habit of printing confirmation emails. Confirmation emails are designed for screens and to be viewed comfortably even on smartphones (despite the limitations of the medium). Booking summary printouts from WebHotelier's Backoffice, however, are designed for print. We try hard to fit as much information possible to minimize paper & ink usage. There is also one more piece of bad news. We've had to drop the XML/CSV attachment feature since it contained PII as well. As a replacement, we recommend using our API which is much more feature rich and supports real-time PUSH. The policy has been written clearly and simply for the user to facilitate its understanding, and to freely and voluntarily determine whether they wish to provide their personal data, or those of third parties, to you. Nothing is changing about your current settings or how your information is processed. Rather, we’ve improved the way we describe our practices and how we explain the options you have to update, manage, and delete your data. Announcing PII Data Retention Policy setting. 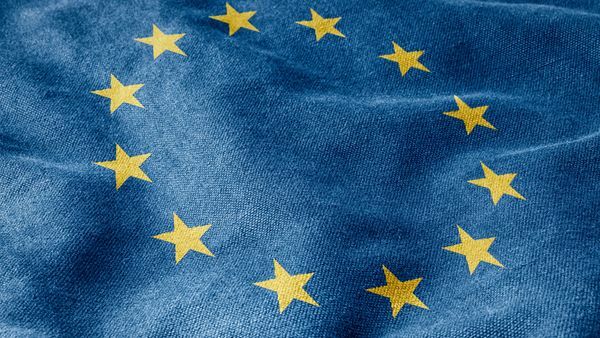 To help hoteliers with GDPR compliance, Personally Identifiable Information (PII) stored in WebHotelier can now be scheduled for anonymization after a certain period has passed. You can select your policy from the main menu, under Settings -> General. Please consult with your company/organization’s legal counsel to determine if this setting applies to you. We do not allow periods less than 14 months because we have the PCI-DSS requirement to preserve all data for at least 12 months. We then add another 2 months as a grace period. NOTICE: We will *not* be enforcing this setting on May 25th. Instead, we will give you a few weeks/months to change your mind. WARNING: Data anonymization is permanent. No copy of your original data will be preserved. Data retention applies only to data stored in WebHotelier systems. If you've shared PII with other systems (e.g. your PMS) you'll have to manage that data separately. If you stop using WebHotelier, you can request data removal at any time. Changes to this setting takes effect after 24 hours. Announcing per-user PII access privilege. Hoteliers can now opt-in to remove access to Personally Identifiable Information (PII) from certain users. Users with no PII privileges will see anonymized data in booking summaries, printouts, reports, and exports. We recommend enabling this setting for all users that are not involved with bookings or customer service. NOTICE: This setting will come into effect on the May 25th deadline. Announcing DPO role for hotelier & operator users. Hoteliers can now assign the role of Data Protection Officer (DPO) to one of their users. You can assign the role by editing any of the users in WebHotelier's Backoffice and checking the DPO checkbox. The user must have all their profile information provided and please make sure the contact information is up-to-date. Does my company/organization need to have a Data Protection Officer (DPO)? Your company/organization needs to appoint a DPO, whether it's a controller or a processor, if its core activities involve processing of sensitive data on a large scale or involve large scale, regular and systematic monitoring of individuals. In that respect, monitoring the behavior of data subjects includes all forms of tracking and profiling on the internet, including for the purposes of behavioral advertising. The above is not clear enough. How can I decide if I need a DPO? Initial GDPR drafts specified companies/organizations with less than 250 employees did not have to appoint a DPO. This is no longer true, a DPO may be required for a company/organization of any size. You should contact your legal counsel or your local Data Protection Authority for instructions. WebHotelier recommends assigning a DPO role even if you are not obligated by law. Can anyone be my DPO? The DPO may be a staff member of your organization or may be contracted externally on the basis of a service contact. A DPO can be an individual or an organization. Your organization, if required, must involve the DPO in a timely manner. The DPO must not receive any instructions from the controller or processor for the exercise of their tasks. The DPO reports directly to the highest level of management of the organization. Announcing required changes driven by our Data flow mapping. Our data flow mapping has identified a few behaviors that are prohibited by GDPR. We have stopped reporting pageviews to Google Analytics that may contain sensitive data (e.g. booking retrieval URLs that are included in confirmation emails). We have enabled the strictest possible data retention policy in Google Analytics for the profile that measures data from all bookings engines. We use this data for functionality monitoring and to make informed decisions for our browser/OS support matrix. Customers are advised to also set a data retention policy for their own Google Analytics profiles. We have identified an issue where conversion tracking was not reported as "/book-confirm" in Google Analytics but with its real URL that contains sensitive data. We now force the report to be "/book-confirm". Google Analytics e-commerce and event tracking calls were not associated with the virtual pageviews. We now also force this to report "/book-confirm". We have removed Google Analytics tracking from our WebHotelier's Backoffice application for the sole reason that we don't require client-side tracking. We have removed social plugins from WebHotelier's Backoffice application. We've replaced them with direct links to our social pages/profiles. We applied a strict 3-month data retention policy on our server-side log analytics tools. Raw logs are preserved for 1 year as required by PCI-DSS. We have identified an issue where our developer team would receive bug reports that contained PII or other sensitive data. These and other similar cases have been corrected and now data are properly anonymized. We have set procedures in place that anonymize backup data used by our developers for development & testing. These procedures have been already in place for cardholder information (per PCI requirements) but have been extended to PII as well. None of our personnel has access to cardholder information, besides a dedicated person the can grant privileges to hotelier users. This is now extended to PII data as well, with only essential support personnel retaining access. After a booking has checked-out our personnel will no longer have access to PII. Explicit consent is required for sharing PII with 3rd parties. Some examples are review management companies (e.g. Revinate), transfer services (e.g. Welcome), etc. To get consent you'll need to create "Preferences" in your booking engine for each use, clearly describing how guest data is going to be used. 3rd party companies should then check those settings before offering their services. If no consent is given, API users should discard PII data immediately and not save them in any form of permanent storage. Explicit consent is required if a hotelier uses guest data to send marketing newsletters, marketing SMS, or performing any form of communication with the customer that is not based on the legitimate interest of servicing the booking. These cases also require booking engine "Preferences" (as described above) that hoteliers should check before using PII for other purposes. Automated review prompts (e.g. via email) like TripAdvisor ReviewExpress are not GDPR compliant because explicit consent is never given. Therefore, hoteliers are strictly advised to disable ReviewExpress immediately. To properly identify your business as the Data Controller, make sure you have updated your Legal Entity information in WebHotelier. You can access the form from the main menu -> Property -> Billing Information. WebHotelier continuously monitors for malicious or unauthorized behavior to help you protect your data. It monitors for activity such as unusual API calls or potentially unauthorized network calls that indicate a possible compromise. It also detects potentially compromised servers or reconnaissance by attackers. We analyze billions of events across our entire network for signs of risk. Our system identifies suspected attackers through integrated threat intelligence feeds and uses machine learning to detect anomalies in workload activity. When a potential threat is detected, the system delivers a detailed security alert to our developer team. The system goes even further and may recognize compromised hotel website servers. We have already detected a few of those instances and informed the affected customers. The Payment Card Industry Data Security Standard (PCI DSS) is a set of technical and operational requirements for entities that store, process, or transmit payment card data. WebHotelier services have been reviewed by an independent Qualified Security Assessor (Trustwave) and determined to be compliant with the current version of PCI DSS. We designed the security of our infrastructure in layers that build upon one another, from the physical security of data centers to the security protections of our hardware and software to the processes we use to support operational security. This layered protection creates a strong security foundation for everything we do. We distribute data across multiple data centers, so that in the event of a fire or disaster, it can be automatically shifted to stable and protected locations. Each of those data centers is monitored and protected 24/7, and access is tightly controlled with measures like biometric identification and CCTV surveillance. Most but not all the referenced features and procedures are now also applied to PII data. WebHotelier now uses encryption at rest for all PII and other sensitive data. WebHotelier, as PCI-DSS Level 2 Service Provider, has used storage-level encryption for all sensitive data (e.g. cardholder information). Over the past months we've extended the use of hardware encryption to cover all data at rest (data stored in physical disks). This effectively encrypts sensitive data twice. Our systems use FIPS 140-2 validated hardware security modules where our unencrypted keys are only used in memory. Keys are never transmitted outside of the hardware environment in which they were created. No physical person has access to the actual keys themselves. Today we announce that we now apply the same rigorous security features to Personally Identifiable Information (PII) as well. WebHotelier appoints a Data Protection Officer (DPO) ahead of GDPR. At WebHotelier, Trust is our #1 value. Nothing is more important than earning the trust of each of our 4,000+ customers and protecting their data — privacy has always been core to our business. And our privacy model is simple: our customers' data belongs to them. Although not required by the GDPR (since WebHotelier does not track, profile or monitor data subjects at any scale), we've appointed a Data Protection Officer who will be responsible for compliance and serves as a point of contact between the company and supervisory authorities. Our DPO is Apostolos Tsakpinis, WebHotelier's Technical Director and long-time privacy advocate. WebHotelier publishes Introduction to GDPR, F.A.Q., and Glossary to help hoteliers get started with GDPR.